Dual-cure fluoride-releasing resin cement. Cure time is just 30 seconds. Antibacterial, self-etching and self-adhering. Bonds directly to enamel, dentin, composite, porcelain, base, semi-precious and precious metals. 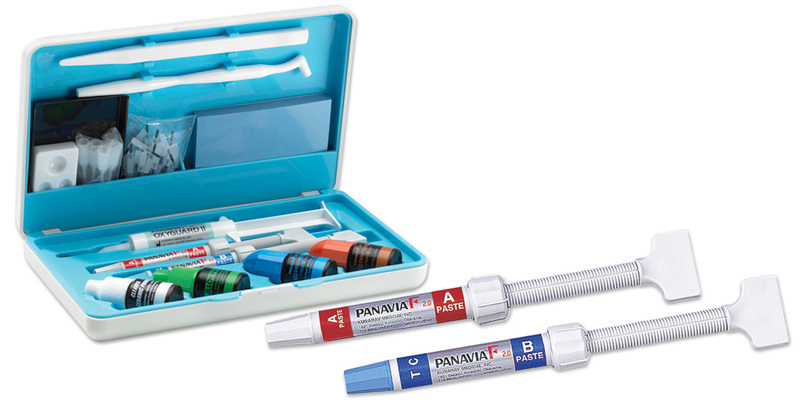 For use with metal & porcelain inlays and onlays, crowns, bridges and adhesive splints. Accessories: mixing pad, mixing spatula, mixing dish, brush holder, disposable brush tips, disposable nozzles, light-blocking plate. Accessories: mixing pad, mixing spatula, mixing dish, brush holder, disposable brush tips, disposable nozzles, light- locking plate. Panavia F 2.0 earned 4.1 stars out of a possible 5.0. Self-etching primers almost ensure no sensitivity. It gives you more than enough working time for virtually any type of restoration and shading is adequate. Hand-mixed – no automix option. Phosphoric acid did not affect bond strengths on enamel at 24 hours, but did increase the values on dentin. Lowest dentin bond strengths in self-etch mode. Unblemished track record keeps it near the top of this list – the clinical success of this product is extraordinary, even with the low dentin bond strengths.